NEARLY SIX MONTHS AFTER THE FLOOD in December, the formerly wet, disgustingly moldy books are trickling back into Special Collections from the book hospital -- Kater-Crafts Bookbinders of Pico Rivera. 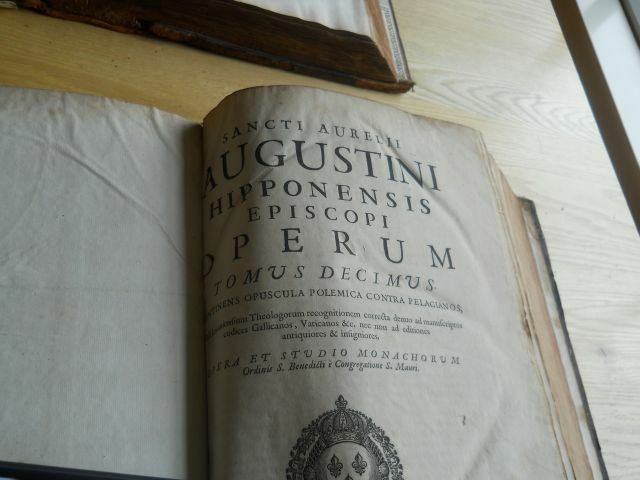 First among the patients was St. Augustine of Hippo, whose Opera Omnia in eight big tomes took a direct hit when the ceiling collapsed in a rush of rainwater. The 17th Century paper rapidly developed mold (middle photos) and the bindings -- already pretty wrecked -- started to crumble. 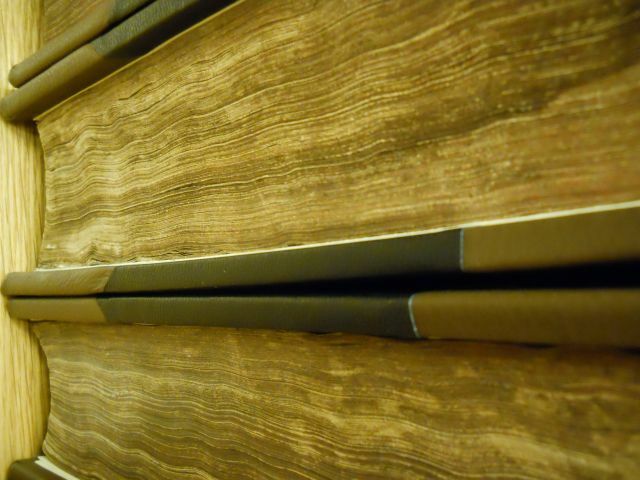 In the opinion of my friend Kristen St. John at UCLA, there was nothing to be gained by trying to keep the old bindings, which anyway weren't original. After their page by page vacuum job, I drove the books over to Kater-Crafts and waited for the results. They're beautiful. Are they too beautiful? This is one of the knotty questions in library preservation. Should old books "look old"? 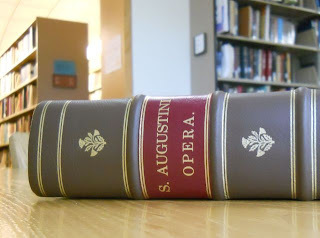 If the old bindings aren't artifacts unto themselves -- and St. Augustine's weren't -- should they be kept, even if they're falling apart? It's a matter of taste and policy. We're a library, not a museum, and the books are here to be used and looked at. But like the critics who disapproved of the Sistine Chapel restoration, some people think a bright and shiny new binding on an antique book is jarring. The way I see it, one goal here is to ensure that the books are around for another 350 years. They were already rebound a couple of times, according to Kristen, so one more round isn't going to hurt. Neither does it mean binding them in standard library buckram, as someone suggested, and if you want to see some heartbreaking rebindings I've got plenty of buckram to show you. In fact, I like the way the new bindings juxtapose with the old, water-stained pages (bottom photo), especially on St. Augustine. The bishop of Hippo wrote these works in the 4th and 5th Centuries, and yet they're as current as today, with new translations appearing regularly and e-book versions widely available. Shiny new bindings are a vote for the bright future of a timeless author. They definitely liven up the place. And they're a pretty good reminder that rain gutters require annual maintenance. Where would a Catholic college be without good old St. Augustine. I'm glad he is back in his shiny new bindings, and you are so right that his work belongs on the shelf to be read and enjoyed by future generations. Unlike museums, libraries are meant to be used, not looked at, or into, from a distance. St. Augustine looks pretty handsome for what he has been through. Nicely done on your part, and Kater-Crafts'. How bad was that mold?